Welcome to the South Bay Scooter Club website homepage! Hello! And welcome to the South Bay Scooter Club website. This website is all about riding motorscooters in Southern California, such as vintage, Italian ones, like Vespas and Lambrettas (though all scoots are welcome!). 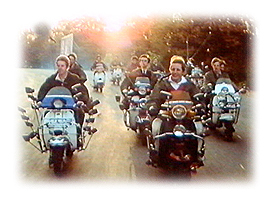 This club was formed to help fill the geographical riding gap between riding with the L.A. and Orange County Scooter Clubs of Southern California. We are not into officers, dues, duties, etc. We just want to ride at least once a month, so that we can get our small scooter riding "fix" in. So, if you're in and/or around the South Bay, and/or just like to ride, come on out and do it with some other scooter maniacs!! Everyone is welcome no matter what you ride! (currently being sent out to over 405 SoCal scooterists) full of upcoming events and rally news, scooter classifieds, and info on SoCal regular rides, go to our Newsletter webpage. The South Bay Scooter Club, which came out in the Daily Breeze Newspaper. · All participants/riders are aware that they are traveling on open public roads and are responsible for their own safety and compliance with all road rules and laws. The SBSC retains the sole right to censure and, if considered warranted, to discipline/ban/expel a rider who flouts the rules as described. Never heard of scooters before? 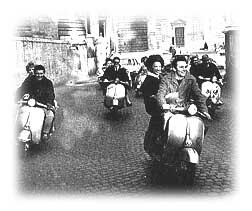 Click here for info about the foremost manufacturer of scooters in the world, Vespa.